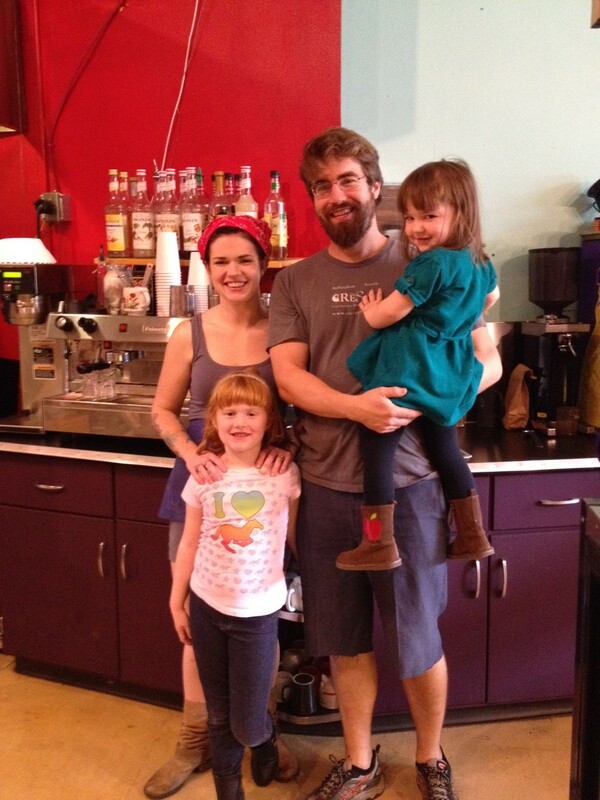 In fall of 2013, Lydia Mehrtens and her husband, The RE Store’s own Tim O’Donnell, acquired downtown Bellingham bakery La Vie En Rose, renamed it Gypsies and Ginger Snaps – a Charming Shop & Bakery, and reopened the next day. For Mehrtens and O’Donnell, Gypsies and Ginger Snaps is the resurrection of a dream. The couple had previously owned a bakery in LaConnor, WA that closed its doors in 2008 after the collapse of the tourist economy there. Mehrtens, a dynamo of positive energy, was undaunted by that closure. Baking professionally since she was 15, she held on to her bakery dreams, while also running a shop at a local flea market collecting and selling jewelry, clothing, and upcycled furniture. In 2011 she started baking again with a coffee cart attached to a small vintage store in Fairhaven. The café and the shop were brought together as one, and O’Donnell constructed the mobile coffee cart with materials primarily sourced at The RE Store. Two years and two moves later they found themselves at the current location at 111 W. Holly St. In addition to repurposing several pieces of restaurant equipment for the new café, such as stainless steel sinks and pre-rinse sprayers for commercial dishwashers, O’Donnell, employed at The RE Store since 2010, uses his woodworking skills to create and refurbish tables, chairs and other pieces of furniture to use and sell in the shop. “I can’t imagine accomplishing so many projects and simple day-to-day maintenance at the bakery without the help of The RE Store” says O’Donnell. The espresso machine is the one piece of equipment Mehrtens and O’Donnell kept from the La Connor bakery – it is still in use today. Gypsies and Ginger Snaps is a lesson in how to salvage not only furniture and equipment, but one’s own dreams. 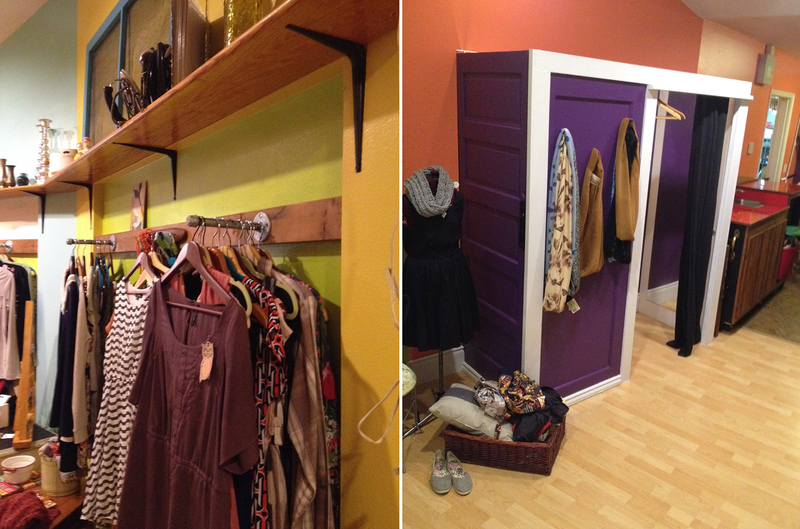 Salvage-inspired retail fixtures at Gypsy and Ginger Snaps, including pine bleacher board shelving and galvanized pipe flange clothing racks (left). And the dressing rooms (right) are made from 3 solid panel doors, misc lumber + trim, curtain rod, mirror, recycled paint – all from The RE Store. Gypsies and Ginger Snaps is open daily 9am – 6pm and can be found on Facebook here. For catering inquiries, contact Lydia Mehrtens via email at: gypsiesandgignersnaps [at] gmail.com.